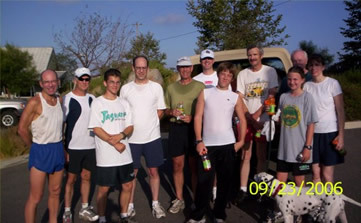 You've seen them - a runner now and then jogging around our little country town of Valley Center. Don't they look very solitary in this rural community? We don't have to be all by ourselves. There are a lot of runners in this here little town. Let's get together and share training, stories, advice and hopefully a little fun as we enjoy running around Valley Center and surrounding North County cities! Escondido, San Marcos, Rancho Bernardo, Vista - COME ON OUT! The run will happen even with light rain or shine (cancelled for hurricanes or snow). Check back on this website for up-to-date information and notices. The First Meeting Is In The Books!